Landcoil is manufactured in blue uPVC. The system is durable and easy to install. Landcoilkitemarked to BS4962. Yellow is also available subject to minimum order quantities and lead times. 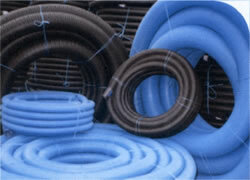 Fieldcoil is manufactured in black Polyprpylene with both perforated and uperforated options. Fieldcoil meets all the requirements of the BS4962 standard and is accoringly kite marked. Sizes up to 200mm are manufactured in uPVC, quality assured by our BSI Kitemark to BS 4962. Sizes up to 160mm are available in polypropylene. Diameters of 260mm and 350mm are manufactured in HDPE, compatible with standard couplings, seals and fittings. 330mm size is manufactured in uPVC and compatible with Poltwin fittings. Designed specifically for the agricultural market as a lower cost alternative to Ridgidrain for lighterduty applications. Ridgidrain remails the product of choice for heavy duty applications asystems requireing leak tight joints or BBA certification.